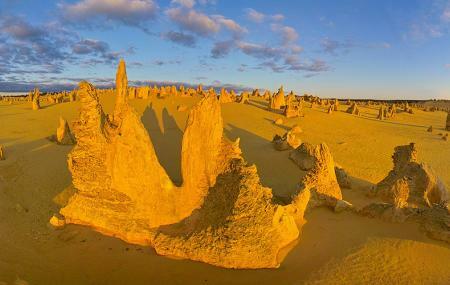 If you are travelling in Australia, a visit to the Pinnacles Desert, Cervantes will be worth a once-in-a-lifetime experience. Located in Western Australia, this spectacular desert is one of the top attractions with its wonderful and stark landscape, thousands of huge limestone pillars, observation decks and numerous parking bays. Watch out for the mushroom- shaped pinnacles that resulted from calcrete capping. You can choose to discover the natural wonders of this far-flung Pinnacles Desert on foot at your own pace as the parking bays at different points allows a one-way drive for the pedestrians. Don’t forget to take a professional guide with you to pick up milestones in your scout. Definitely worth the visit. There is a gift shop, gallery, restroom and small snacks. Highly recommend you plan accordingly as the closest towns are about 2 hours away. Beautiful and unique view definitely not something you would see - through a guided tour bus especially given how narrow the roads are.